Electa is lightness, young and young for high-tech rooms. The front glossy cabinets and gray glass back splash gives this home an unmistakable personality with vivacious, bright combinations. 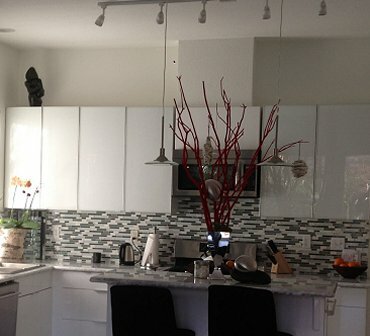 This creative, adaptable and beautiful kitchen was completely redesigned. 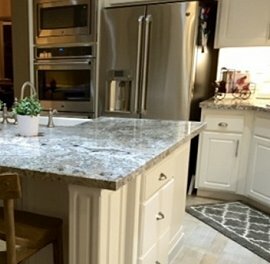 From the marble flooring, to the functional granite island, unique glass back splash and custom made cabinets. This extensive selection translated a vision of a home into existence. This curved railings creates a highly visible and uniquely modern one-of-a kind look. 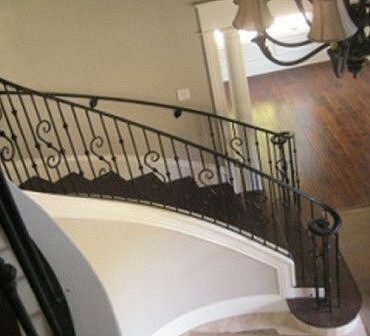 The charcoal black architectural balusters accentuates the chocolaty tone of the stairs. 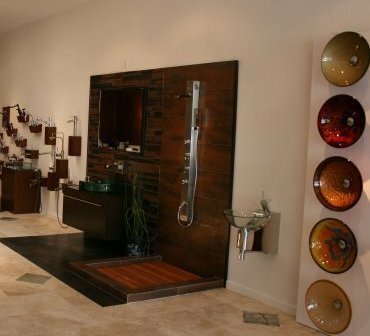 This showroom has left many customers inspired about the amazing designs they can transform their kitchens or bathrooms into. Its style, the excellent looking marble & granite flooring, and the bathroom display show a series of can-do tips for the best space. The image speaks for itself. 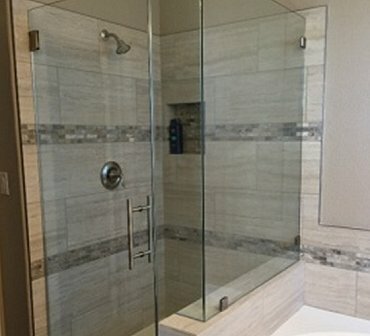 This guest bath shows and innovative and elegant style. It instantly calms the mind and slows the hectic pace of daily life. It's a natural ambiance. 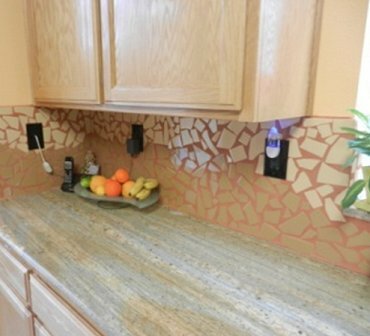 The homeowners loved the idea of using this creative pairing of the granite slab and the mosaic looking back splash. It adds color and pattern without overwhelming the cooking area. The kitchen transitional decor appeals to their style and is a convenient layout that really allows the owners to host their guests. 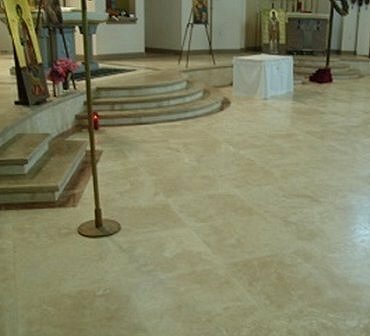 This elegant looking marble floor added beauty and durability for the entry of this Church. 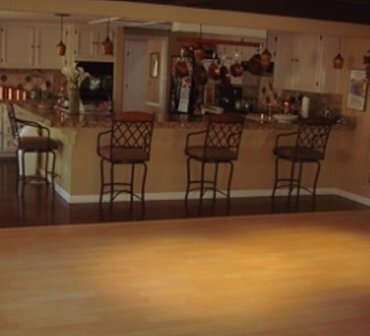 The dark and light flooring combination pairs very well for a contemporary looking and comfortable living kitchen. It serves to unify more diverse colors. 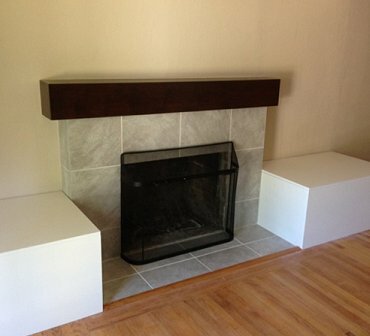 This marble fire place surround is naturally beautiful and shows style to the home. The timeless color adds a warm earth tone texture and complements the design to create an impressive existence in the room. 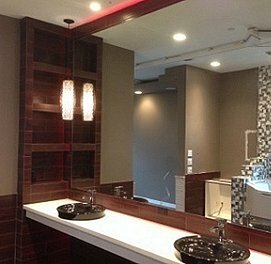 This small bathroom was designed to be equally functional and elegant. From its essentiality to the range of materials chosen, the bathroom has an innovative design. The luxury of convenience is to use small space smartly. 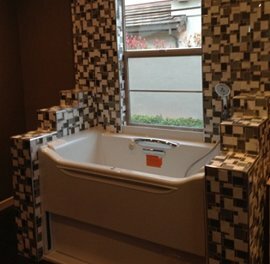 This bathtub is surrounded by mosaic tiles and it creates the perfect mood for your bath/showering escape. The tub's ends provide a generous space devoted to shower storage and decorative tile within the bathtub space. This is the charm of tradition bright and cheerful, radiant and rich in its characteristics by a design which brings together elements strongly linked to the memories of the past with an up-to-date image and avant-garde functionality. The granite island section gives you endless possibilities, a food factory, a chill-out zone and it's the heart of your home. 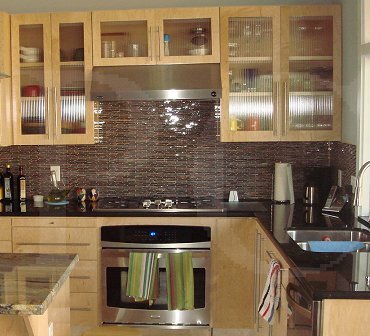 The brown wood effect doors, drawer front, stainless steel appliances brings together the traditional and the new. 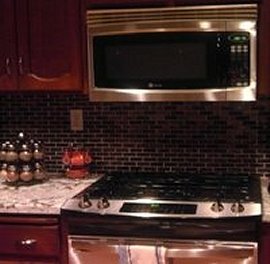 The wood finishes go from oak to cherry to birch to be combined with the black and white granite countertops and stainless steel appliances.